Here’s a great view at V and F Sheet Metal showing our two Trumpf 7036 CNC press brakes continuing to work when the emergency lighting was being changed. Having their own light supply is important when the operator is looking a very small parts with small bends. The machines also have a support table and can be sat at for the most comfortable operating position which is important when working on large batches of parts. 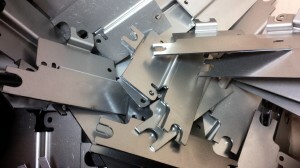 The small stainless steel brackets start off with being laser cut to a fine tolerance. This ensures that the bent parts will be consistent in production. 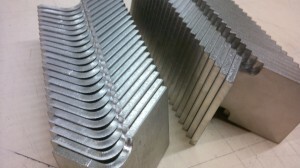 Using top and bottom standard V tooling we can produce a vast range of bent sheet metal components. From simple 90 degree bends, forms, safe edges, joggles and multi-bent curves these Trumpf 7036 CNC press brakes are very versatile and productive. The final stainless steel brackets have two 90 degree bends on the ends. 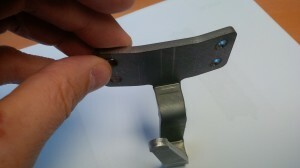 Another sheet metal part manufactured at V and F Sheet Metal. For more information on sheet metal work and how it’s made take a look at this link. Cutting circles greater than the diameter of a single hit tool have always been problematic in sheet metal. Smaller holes can easily be stamped with a simple round punch and die in a CNC punch press, fly press or power press. 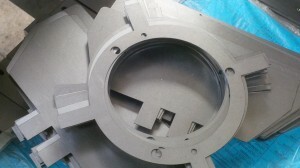 We use this type of tooling all the time in the sheet metal work that we produce. 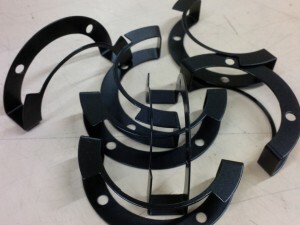 Holes above 76mm diameter can be produced with a CNC punch press by either nibbling with a smaller tool and then cleaning up or by using a “banana” tool ground to a given radius. Both of these methods are good and we often use them to produce internal and external curves. The best solution to producing a perfect continuous circle is to use a laser cutting machine. 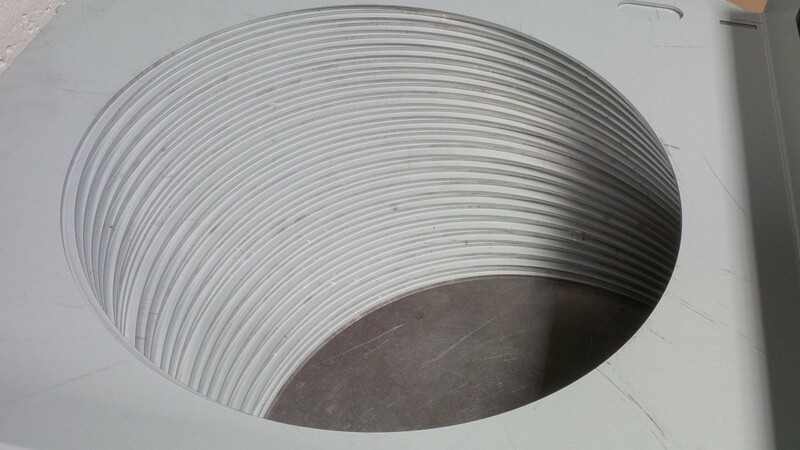 Our Trumpf 3030 fibre laser is perfect for this type of work whether it’s a circular cut-out such as this shown here or a curved outer profile it makes no difference to us. The laser is also able to cut out ellipse shapes, irregular complex curves and irregular polygons. Using Radan software the start and stop points are automatically programmed to show no witness on the finished part reducing or often eliminating the need for any edge de-burring. So if you have a sheet metal working project that has a large circular hole give us a call and we will be happy to produce a quote for cutting the parts for you. 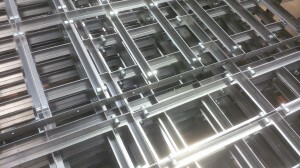 No bracket is too simple or complex for us here at V and F Sheet Metal. 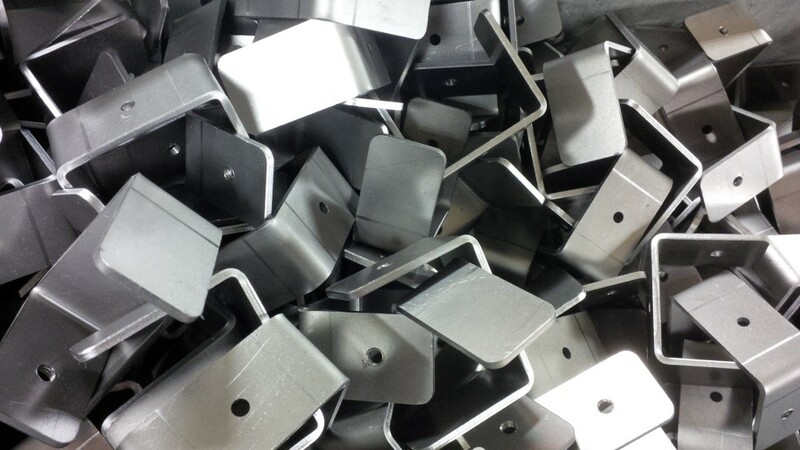 These galvanised mild steel angle brackets which are used to support fencing panels are just typical of the sheet metal work that can be going through our factory in any day of the week here in Fareham, Hampshire. These brackets have been CNC punched out from a standard 2mx1m sheet of metal and had the sharp edges removed before being folded up into the angle shape you can see here with two 135 degree bends. 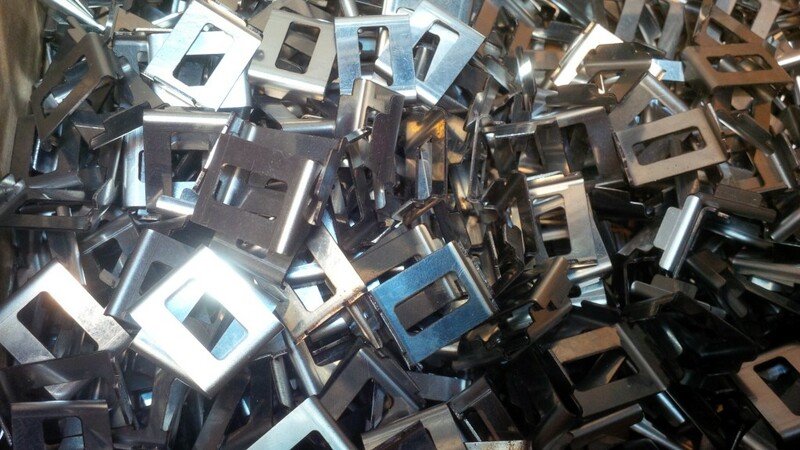 The whole process of CNC punching out, edge de-burring and folding was carried out in one day for more than 1,000 angle brackets. If you have a sheet metal bracket that you need to have manufactured please give us a call or send us your drawings and we will be happy to help you. We have just manufactured a batch of mild steel clamping brackets for one of our customers made to their own design. You can see that the brackets are not a complex part but it’s surprising how many features there are that we have to take into account when deciding which machines to use to manufacture them. When we first look at a new component such as these sheet metal brackets we have to decide whether we will laser cut or CNC punch out the blanks. The factors that can play a part in this decision are the material type, thickness, number of holes, complexity of cut-out shape, and complexity of the bracket outer profile. These brackets could have been CNC punched or laser cut with a result that the customer would have be happy with. We selected laser cutting with our Trumpf 3030 fibre laser to eliminate the edge de-burring so that a clean outer profile was achieved as the bracket was a cosmetically important part. Let’s take a look at the stages we went through to produce these brackets, not only correctly to our customer’s requirements but in an efficient manner. 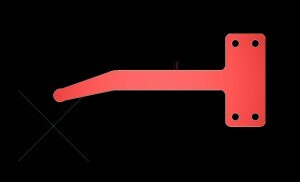 We created a 3D model of the bracket and used this to generate an accurate 2D blank for the bracket. We then tooled this part and filled up a standard sheet of metal, a 2M x 1M sheet with the brackets. 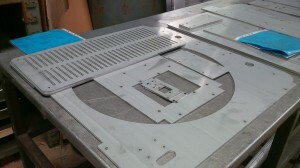 All the necessary coding was generated to drive the laser cutting machine to produce the sheet metal bracket blank. As well as laser cutting a clean outer edge profile the ability to cut any corner radius size and blend it to the bracket outer profile. This is great for small batches of work where a customer would not want to pay for special corner radius tooling. Not only does the outer edge of the bracket blank look clean and a continual profile it needs no de-burring in mild steel at this gauge. 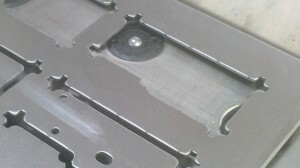 This is a big advantage for laser cutting in helping to redeuce the secondary cleaning operations. If we have punched this bracket blank out on our Trumpf 3000 CNC punch press we could have tapped the M3 threads in the machine. We chose not to do this on this occasion so that we could have a really clean outer edge from laser cutting. This meant we would have to tap the thread as a secondary operation which was done with a tapping head in one of our pillar drills. Based on the Segensworth East industrial estate near Fareham, Hampshire, V and F Sheet Metal manufacture sheet metal work and fabrications from their 13,000 square foot factory near the M27. They manufacture a range of sheet metal work for a range of small to medium sized companies across the UK. Here are another couple of examples of recent sheet metal work projects that they have been involved with. 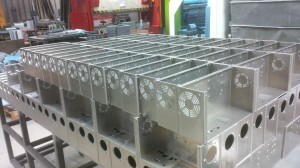 Large enclosure housings manufactured from 1.5mm 304stainless steel. These casings were cut from 2500mm x 1250mm sheet and only one came from each sheet. They were CNC punched with ventilation louvres stamped in each side. They were fabricated from several stainless steel parts all welded together to make a fabrication with a door fixed with hinges and locking pins. These formed zintec coated mild steel covers have been laser cut and formed on one of our CNC press brakes. The curved radius bend was achieved with a large single stroke curved form tool and the 2 smaller 90 degree return bends with simple V blade and V block tooling. Both projects were manufactured in December 2015 and to our customers own designs. If you are looking for a sheet metal working supplier based in Hampshire please give us a call on 01489 577786 or if you are in the area please pop in for a chat and take a look at our manufacturing facilities. Brass is such a nice sheet metal material to work with in a modern sheet metal working factory. We can CNC punch it in just the same way as we would punch out mild steel, aluminium or stainless steel. No special tooling or processing is needed to produce the flat blanks straight from standard sheets of metal. We are also really lucky in having a Trumpf 3030 fibre laser which enables us to laser cut both copper and brass sheet up to 6mm thick where CO2 lasers would not be able to process these materials we can laser cut them in just the same way that we would cut stainless steel, mild steel or aluminium. It’s just the same with bending brass sheet metal components. 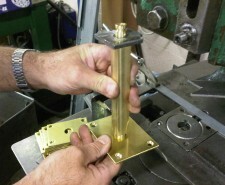 The same tooling that is used on all our CNC press brakes can be used with brass. These surround parts for a box housing have had the first 2 bends already folded up on the Safan e-Brake at this stage with basic V bend tooling. In this photo you can clearly see the back stops on the Safan e-Brake CNC press brake setting the depth of the bend to be formed. You can also see the top and bottom V tooling and a gap set between them so the final bend of the box surround can form between the tooling. There is also some thin plastic V block protection material clamped to the tooling to help prevent the outer surface of the brass being marked when the bend is being formed. The brass sheet also have a thin protective peelable film of plastic on it which helps to keep it scratch free and the customer can peel this off when they are ready without any residue being left on the component. The final box surround components have been folded up and just need to have a couple of tack welds to hold them together into a rectangular shape. An engraved face plate completes the assembly and creates a housing for door entry equipment for flats. Although brass is not a common sheet metal to work with today it still has a part to play and we make a series of components from items like these boxes to brass menu display boards, decorative light fittings, decorative strip shopping fittings and electrical contact clips. Perhaps you have a brass sheet metal component? We would happy to take a look and produce some prices for you. Video of the CNC press brake being used to form up the brass box surrounds to a program. What might seem at a first glance to be a simple sheet metal folded bracket is more complex than you think. If you click on the image for an enlargement you can see that aluminium blank has been folded with 5 bends with different angles and different bend radii. 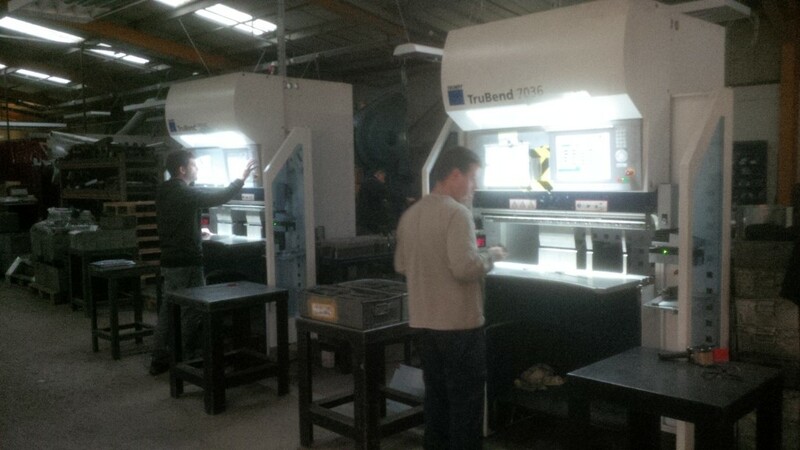 The CNC tooling in the background was our Trumpf tooling used on once of our Trumpf 7036 CNC press brakes. The Trumpf 7036 is so flexible when it comes to folding sheet metal components that a range of bend radii, bend lengths and bend angles can all be produced with the same tooling. Just by programming different lengths and angles into the folding machine control a complex sheet metal component can be produced quite easily. 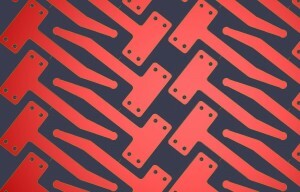 Here is a much simpler folded sheet metal component. If is an aluminium angle bracket that has again been folded on a Trumpf 7036 CNC press brake but this time it just has a single 90 degree bend. A nice touch here is the right hand bottom V block has been raised by a few mm so that it acts as a positioning stop for the operator to bend against. This enables really quick positioning of each part for the bend against the back stop and speeds up the bending operation, saving time and money for the parts manufactured. If you have any small folded sheet metal components that you need to purchase please let us take a look for you. We are happy to provide prices or design suggestions to reduce the cost of your components in production. Either working with copper sheet metal or copper bar V and F Sheet Metal can provide solutions to your copper components needs. We can laser cut copper sheet metal up to 6mm thick with our Trumpf 3030 3KW fibre laser, CNC punch sheets of copper with our two Trumpf CNC punch presses and work with copper bar with a series of machines. 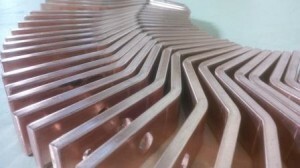 We can saw, crop, pierce and drill copper bar as well as fold it with a range of CNC press brakes. So it you are looking for copper earth tags, heat sinks, electrical buzz bars etc made to your own designs please get in contact with us. You can call us on 01489 577786 for a chat with a member of our engineering team or e-mail your drawings to sales@vandf.co.uk for a quote. All sheet metal brackets no matter how simple or complex start with a 3D model on our Radan sheet metal software system here at V and F Sheet Metal. We can be lucky sometimes and have a 3D model given to us by our customers which can save us time in producing the final developed blanks for cutting. If not, we then have to create one ourselves to act as the master file for all material information, thickness, hole sizes, outer profile and bend information. Once that has been completed the flat blank can be created and used to program either a CNC punch press or a CNC laser cutter to enable the parts to be cut from flat sheet metal. Here’s the Trumpf fibre laser in action cutting out the 1.5mm thick mild steel bracket blanks using nitrogen as the cutting gas. The first 3 are missing as they were used to check that the laser edge was clean and the component size was correct to the drawing / 3D model tolerances. Once that was approved the rest of the batch could be laser cut repeating the same part again and again. You can see what a dynamic cutting process it is from this photographic still image capturing the moment the laser is piercing a hole straight through the 1.5mm thick mild steel sheet. 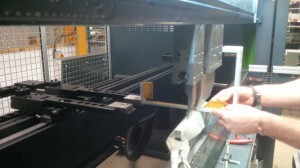 The operator can monitor the progress of the laser cutting while it’s in process. They can stop the machine at any point and make adjustments or remove components that are in the way of the laser cutting head. You can see that the batch of components turns green on the screen as they are cut so we are approximately a third of the way through the batch at this point. The layout of the components on the sheet is controlled by the CNC programming department along with the design of each part. The laser is cutting the sheet metal with nitrogen as the assist cutting gas so that a clean oxide free edge cut is achieved. If you have a sheet metal bracket that needs laser cutting please give us a call or send an e-mail with your drawings to sales@vandf.co.uk as we will be happy to quote for your sheet metal work. Another sheet metal work project completed in November 2015. A complicated looking shape but simple really, just laser cut mild steel, CNC folded bends using swan neck tooling to achieve the deep bends and then powder coated black. These parts were created as 3D models, unfolded, nested, production route cards created, manufactured and powder coated in under 10 working days. Many repeat purchase orders are produced quicker than this when they are just simple sheet metal brackets, plates or boxes. For more information on sheet metal work and how it’s made please have a look at this page. Sheet metal work is our business and we would love to quote for any sheet metal work that you need to have manufactured. 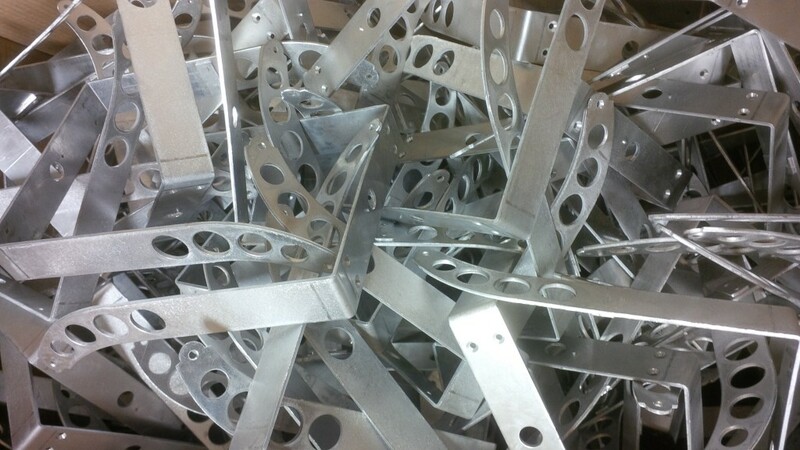 We manufacture a whole range of sheet metal work here at V and F sheet Metal in Fareham, Hampshire but if I had to pick one sheet metal item that we are really good at it would be sheet metal brackets. Whether they are CNC punched out on one of our 2 Trumpf CNC punch presses or laser cut on our Trumpf 3030 fibre laser we just love sheet metal brackets. These mild steel brackets have been laser cut and then folded up on one of our Trumpf 7036 CNC press brakes. The brackets could just as well have been made form Zintec, galvanised steel, aluminium alloy, stainless steel, brass, copper, pre-painted steel, spring stainless or tin plate and we would still have been happy to make them. We have a large range of punching and bending tooling that suits all sorts of sheet metal brackets from 0.3mm thick tin plate electronic screening can brackets to 8mm thick steel building support brackets. If you are looking to purchase sheet metal work that has been CNC punched then please contact V and F Sheet Metal in Fareham, Hampshire. 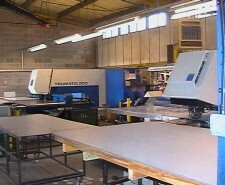 We have 2 Trumpf CNC punch presses and a wide range of tooling which we have built up over many years. Supported by our experienced design team using Radan sheet metal software we can offer help to you when you need to improve your sheet metal work design and we can offer quote options so you can see the price difference between different designs. If you already have a proven design we can take it in DXF, DWG, SAT, STEP or PDF format and run it through our CNC programming software before we produce a price for you to ensure there will be no problems in manufacturing. The 2 Trumpf CNC punch presses work perfectly together using the same tooling systems to allow us the freedom to move jobs between each machine when you may have a rush job or need some samples quickly to prove a new design idea you may have. The 2 CNC punch presses tend to work a single shift system so there is always spare punching capacity for that one off rush job that comes along if needed. Situated between Southampton and Portsmouth right next to the M27 in the south of Hampshire V and F Sheet Metal are ideally placed to service local companies needs in Hampshire as well as across the UK with door to door deliveries when needed and overnight pallets services. If you have a sheet metal work project and you want to come in to see us and view our factory we would be pleased to show you around. You can always simply e-mail your drawings to sales@vandf.co.uk and we will take a look at them for you. 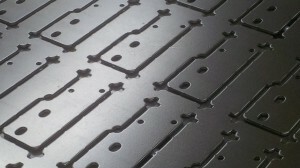 So for the full CNC punching sheet metal service in the heart of Hampshire contact V and F Sheet Metal. V and F Sheet Metal specialise in manufacturing sheet metal work in thin gauges. 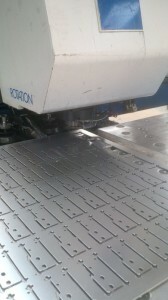 We can CNC punch sheet metal from 0.4mm up to 3.0mm thick in a range of steel, aluminium and stainless steel alloys. Thicker gauges can be worked on with our Trumpf 3030 3KW fibre laser cutting machine. 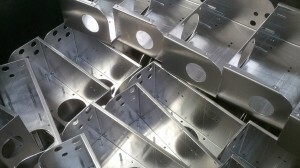 These aluminium boxes are typical of the sheet metal work projects that we get asked to manufacture for our customers. These boxes have been CNC punched, edge deburred and CNC folded on one of our Trumpf 7036 CNC press brakes. Shown here at this stage they are in the process of having sheet metal bushes and studs inserted on a Haeger bush inserter machine to act as fixing points for various electronics components that will be assembled into the boxes after they had been welded on the corners and powder coated. 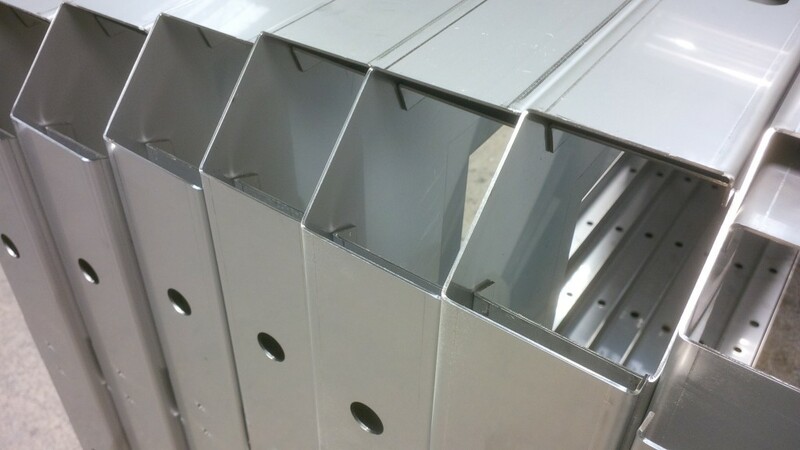 Have a project that needs sheet metal boxes and lids then give us a call. We are sure we will have a CNC tool to punch out the correct cut-outs and if not we can always laser cut them for you. Sheet metal components manufacturers are important for companies who do not have the capability to manufacture sheet metal components for themselves. This might be due to the lack of overall requirement not justifying enough production to have an in house manufacturing department, lack of the right skills to retain sheet metal manufacturing in house or sometimes the opposite in too much work for the sheet metal work capacity that they have. 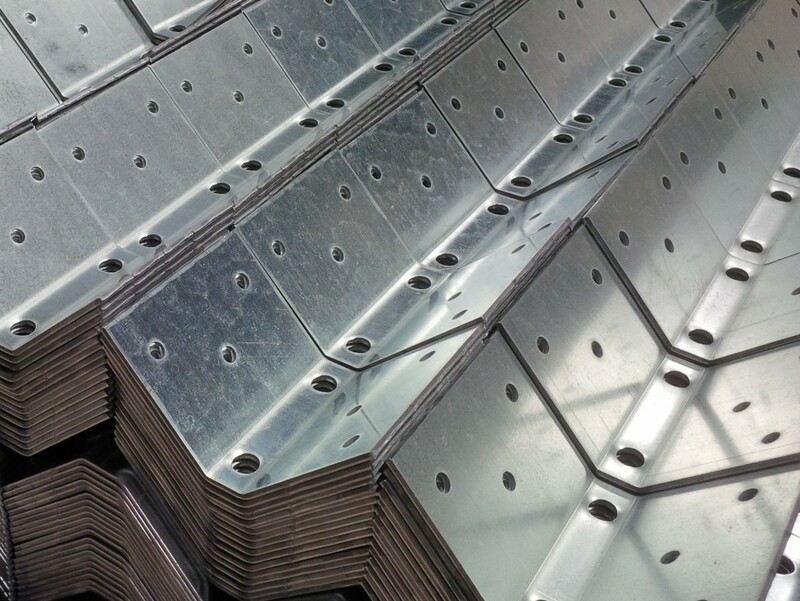 For whatever reason when sheet metal manufacturing is needed on a sub-contract basis either for a one off project or on going repeat batches of sheet metal work, V and F Sheet Metal can help you. They have been manufacturing sheet metal work components, assemblies and welded fabrications for over 30 years now to a wide range of companies in the UK and into mainland Europe. From lighting companies, heating and air-conditioning work, professional audio equipment and electronics enclosures are just a few of the areas V and F Sheet Metal have been involved with for decades. Offering laser cutting, CNC punching, CNC bending and a whole range of secondary welding and fabrication services from laser cutting and bending small brackets, CNC punching and folding enclosures, to welding stainless steel fabrications and press work. If your parts need to be painted, zinc pated or anodised then they have a network of suppliers to offer the right service and price. 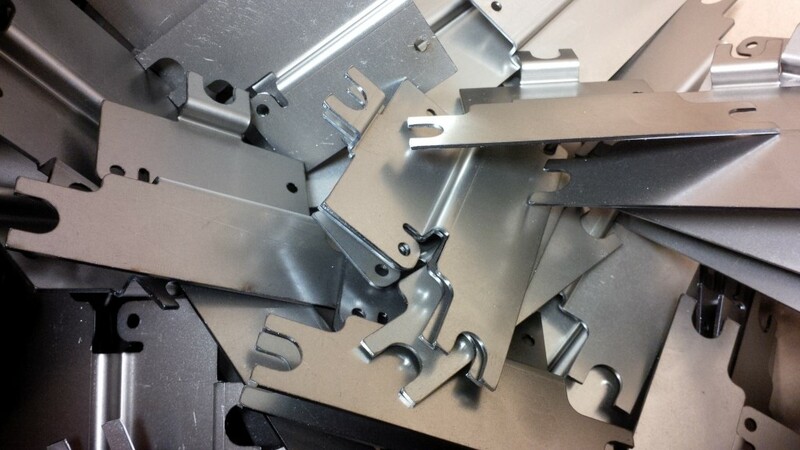 From thin gauge mild steel brackets that have been laser cut, as shown here, thick stainless steel channels or folded aluminium profiles we will have your sheet metal manufacturing needs covered here within our factory at Fareham, Hampshire, UK. If you have any sheet metal manufacturing needs and have drawings that you wish us to review for you then please e-mail us at sales@vandf.co.uk or call for a chat on 01489 577786. When we use our Trumpf 3030 fibre laser cutter to laser cut sheet metal blanks for production we normally fill each sheet with the same component. 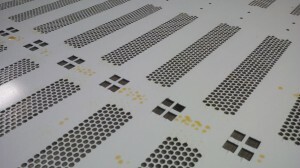 This enables us to get the best fit per sheet and the least amount of time on the laser machine for each type of part. Sometimes however we can fit a “family” of parts together onto the same sheet. This might be a simple as boxes and lids together or front panels and rear panels together or left hand and right hand brackets together. This technique is useful with smaller batch sizes so that all the parts needed for a particular job that come from the same material and gauge can be laser cut in one go reducing the number of CNC programs generated and it makes it easier for the machine setter to produce all the parts in one set up. Using Radan sheet metal software we can organise all the parts needed to be laser cut onto one program in the office before the jobs go to the shop floor and produce print outs of the CNC laser nests if needed to aid production and help identify work after laser cutting. When designing a sheet metal component that needs a fixed male thread (stud) you have 2 options. The first is to specify a flush head stud which is pressed into a pre-pierced hole in the sheet. These studs can be inserted into aluminium, mild steel and stainless steel components and come in a range of thread sizes and lengths. The advantage of using a pressed in stud is the accuracy of the hole for positioning the stud can come from the CNC punch press or laser machine. The down side is the fact that the stud head can be seen pressed into the sheet metal and can still be visible even when a part has been powder coated. 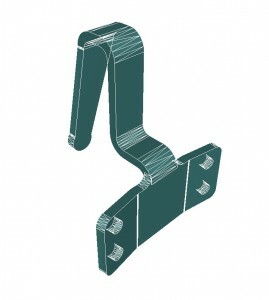 The second option is to use a weld stud, which is shown in the picture above. There are no holes pierced into the sheet so the accuracy has to come from a stud welding jig, which is normally a plate with positioning holes. This plate is positioned on top of the work piece and a weld stud gun is used to fire the weld stud into place. 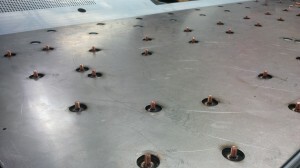 The advantages of this production method is that the weld stud is not visible from the front face which can be an advantage when attaching earth or fixing studs to a front panel. The disadvantage is that this method of production is slower than pressing in a stud so as ever with all these sheet metal processes you pays your money and takes your choice. As with all these design options if you need any help you just have to call us on 01489 577786 or send your drawings to sales@vandf.co.uk and we will be happy to take a look and offer the best solution for your sheet work metal design. The use of 3D modelling software such as Radan sheet metal software has enabled V and F Sheet Metal to work on simple and complex sheet metal designs without the need to spend a lot of time trying out samples before production. The ability to take a customer sheet metal design in a 3D format such as a STEP or SAT file as well as reducing development time also reduces the risk of translation errors with the sheet metal design before any CNC programming is under taken. If on the other hand a customer doesn’t have a 3D model it’s easy for us to create one which is what we had to do in this sheet metal design example shown here. The design was given to us as a 2D DWG file and we created the sheet metal design in the 3D module and then folded it out ready for programming for laser cutting. All the relevant sheet metal design information such as the material type, thickness, shape, size and bend radii were included in the 3D model to replicate the actual finished component and help the software to develop the correct shape and sized blank. 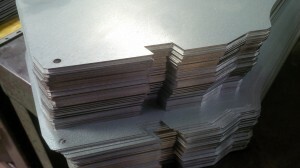 Once the 3 dimensional sheet metal design has been completed and unfolded a flat or 2D blank is produced. This is then where the computer aided design (CAD) becomes computer aided manufacturing (CAM). We can clean up the design and produce the most efficient tool part around each part. With CNC punching this would be to take the sheet metal design and automatically apply the appropriate CNC tooling for the gauge, internal and external features along with any tags needed to hold the parts in the sheet. With laser cutting, as in this case, the tooling is a continual cutting tool laser beam around the sheet metal design outer profile and it’s 4 holes. This is all carried out automatically by the software with very little intervention from the programmer. Once this stage is complete the part is ready to be nested into a full or part sheet. Now we have to fit the sheet metal design to either a full sheet if the order size needs it or a part sheet or even remnant from a past order. Again the software can automatically select the best layout of components to use the least amount of material whilst running the batch. 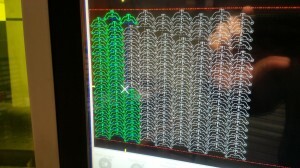 It can also find the quickest path through the pattern (nest) of components and reduce heat build up when laser cutting. All the orientation of components can be controlled by us to enable parts with a grain direction to be specified or when bending is needed after on a sheet metal design and all parts must run in a certain direction to produce the correct bend angles. At this stage all the codes needed to drive either CNC punch presses or laser cutting machines are generated and saved to the system network server ready to be called up on the shop floor when cutting is needed. The final sheet metal design has been transformed into a real useful product, in this case a bracket that is fixed to a leather belt and used to hang a drum for marching bands. 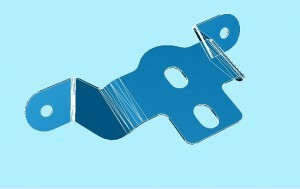 The sheet metal design has been taken from a 2D drawing, through 3D modelling, CNC part and nest programming. The mild steel bracket has been laser cut, edge de-burred and CNC bent. The final sheet metal design was then polished and chrome plated by the customer to produce a highly reflective surface finish. If you have a sheet metal design and you want to discuss some details that you feel we could improve to help with manufacturing and reduce cost please give us a call. Alternatively e-mail your sheet metal design drawings or 3D models to sales@vandf.co.uk and we will be happy to produce some prices for you. 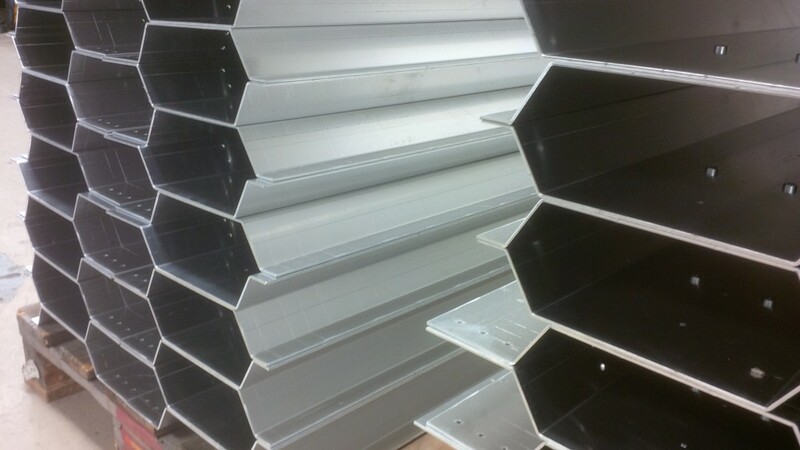 Mild steel is such a flexible material and it is the main stay of the sheet metal we use here at V and F Sheet Metal. We laser cut and CNC punch it out to make accurate blanks with edge profiles, holes, cut-outs and pressed in forms before we do anything else. Being sheet metal workers the vast majority of our work starts as flat sheet although we do work with some mild steel tube and bar. 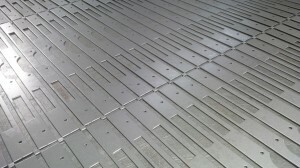 All the flat blank patterns are created in bespoke sheet metal programming software called Radan. This software enables us to 3D model parts, unfold them and tool them either for CNC punching or laser cutting. The mild steel blanks can then be folded up using a range of CNC press brakes that we use here with the latest and biggest being a Safan e-Brake 3M long 100 ton 6 axis CNC press brake bending machine. Along with TiG, MiG and spot welding and bush / stud fastener insertion we can do anything with sheet metal work when it’s in mild steel. We also manufacture sheet metal work products from stainless steel and aluminium alloys. Looking for a Sheet Metal Worker in Southampton, Hampshire? V and F Sheet Metal have been supplying companies in Southampton and across the UK with sheet metal work for over 30 years. Take a look at the services offered by V and F Sheet Metal based in Fareham, Hampshire to see the complete service we can offer you. Our plant pages detail out all the major services we can offer you, gallery pages with hundreds of examples of previous sheet metal work and an active blog with tips on designing for sheet metal production and past projects. If you can’t see what you are looking for please give us a call on 01489 577786 and we will be happy to help you with your sheet metal working project. When V and F Sheet Metal need to fold up a sheet metal work project for one of their customers they have a range of machines to choose from to complete the task. Having 6 CNC press brakes in a busy production factory in Fareham, Hampshire enables them to fold sheet metal work from only a few mm across such as copper earth clips or mild steel support brackets right up to 3M long galvanised steel profiles and stainless steel channels. Using 600mm, 1000mm, 2500mm and 3000mm long machines V and F Sheet Metal have the tools for any folding job that they need to complete. Using straight, swan neck, safe edging and special forming tools a whole range of shapes and sizes of folded sheet metal work can be created across the range of machines with standard tooling at no cost to the customer. 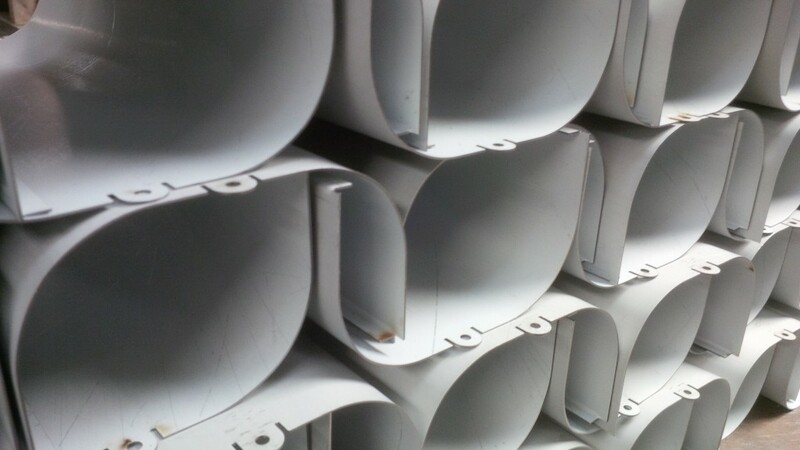 If you have a sheet metal component and are not sure whether it can be bent of not you only have to call or send over your drawing and we will be happy to take a look for you and find the most cost effective method of manufacturing. For successful folding to a given tolerance accurate machines and needed with clean tooling. What is often overlooked is the accuracy of the flat blank that has to be folded. Using Radan sheet metal software to drive Trumpf CNC punch press and a Trumpf laser cutting machine enables V and F Sheet Metal to produce very accurate punched and laser cut blanks. This in turn enables the CNC press brakes to produce the right component again and again in production. Sited right on the M27 near Fareham, Hampshire we are happy for customers to call in and see their sheet metal work being folded or discuss future sheet metal projects. One of the many useful features of using a Trumpf 200 CNC punch press is the component chute that is built into the bed of the machine. 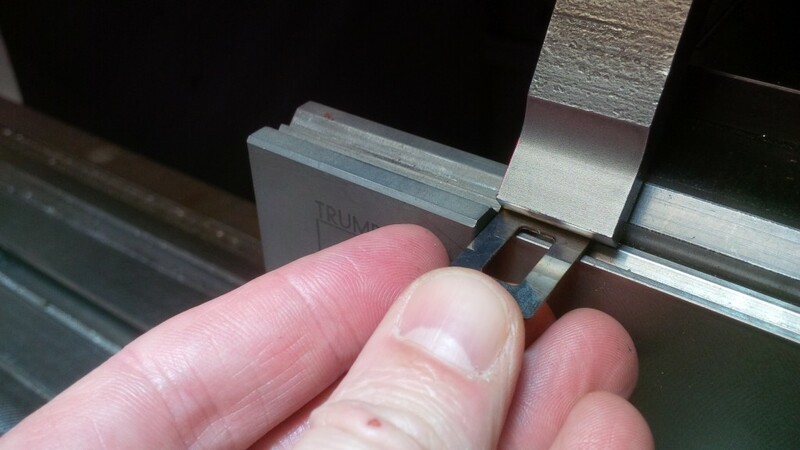 On the Trumpf 200 it can cope with small blanks up to 180mm square. By controlling the order that the CNC punch press tools are used the sheet can be positioned over the chute opening so that the last punch operation can free the blanks from the parent sheet and allow it to fall away from the sheet and straight down the open chute and into a collecting bin below the machine. The sheet metal brackets are created with a series of standard CNC punch tools working in combination to produce the final component shape. These tools we hold on the shelf and can use them any customers standard work that comes along. If special tools are required we can offer advice and price options direct from the original machine manufacturer to get the best tool options to save money and length of tooling life. At this stage you can see that all the internal holes and slots have been CNC punched and the outside profile has been created with the use of several different tools. 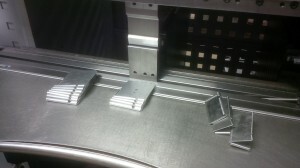 The final hit for each sheet metal blank sends it down the chute and into the bin leaving the hole behind in the sheet. This view shows quite nicely the arrangement of tooling used in the CNC punch marks that are left behind. The advantage of this method of CNC punching is that there are no tags left holding the part in the punched sheet so the de-burring is easier. It is also quicker to collect the parts than having to break or shake them all out of the sheet. This all saves time and as we all know time is money. Looking for sheet metal workers in Portsmouth? V and F Sheet Metal have been supplying sheet metal work and welded fabrications since the 1980s. From our manufacturing base in Fareham, Hampshire we supply a range of companies in and around Portsmouth, Hampshire. From laser cut blanks on our Trumpf 3030 3KW fibre laser and CNC punched sheet metal work on 2 Trumpf CNC punch presses through 6 CNC press brakes and a wide range of secondary manufacturing plant we can offer you the full service when it comes to sourcing sheet metal work. Using 3D software to aid pattern development and efficient tooling and material layout to save money we are happy to help you with your component designs. If you have a sheet metal bracket that need cutting and folding, a sheet metal box that needs folding and welding, a fabricated assembly, spot welded chassis we are the people to ask. So if you are based in Portsmouth or further afield please contact us on 01489 577786 or send us a drawing on sales@vandf.co.uk and we will be happy to help you and prepare a range of price options. As a sub-contract sheet metal working company we have to be able to turn our hand to all sorts of sheet metal projects to help our customers. Here’s a requirement you don’t see every day of the week, custom sheet metal brackets to suspend marching drums from a leather belt. These customer sheet metal brackets have been laser cut on our in house Trumpf 3030 fibre laser cutter from 4mm thick mild steel sheet using nitrogen for a clean non-oxidised finish. 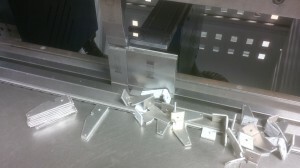 The bracket legs were then folded up on our Trumpf 7036 CNC press brakes in batches of 50. You can see where the 2 slight bends are simulating the curve that will be needed when this bracket is riveted onto the drummers belt. Custom sheet metal brackets are something that we love to manufacture for our customers in all sorts of shapes and sizes. 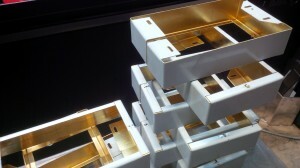 The final bracket was polished and then chrome plated to produce a high shine finish. These custom sheet metal brackets are a simpler item but just as important to their customer. These brackets were laser cut from 3mm 304 stainless steel alloy and again bent up on our Trumpf 7036 CNC press brakes. 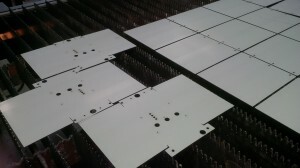 They were needed with other custom sheet metal work for a solar panel installation project. The edge quality produced by laser cutting meant we didn’t have to de-burr these brackets, saving time and money for the customer. Both custom sheet metal brackets were produced from 3D models created in Radan sheet metal software with the drum bracket modelled from a customer’s sketch and the solar panel angle brackets coming direct from a customer’s 3D solid works STEP file. If you have a custom sheet metal bracket design and need some help developing details or simple want a price for manufacturing please contact us and we will be happy to help you. 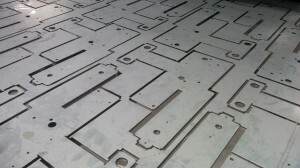 Laser cutting aluminium sheet metal work for window frame trims. 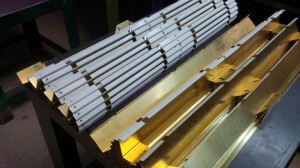 The profile of these aluminium blanks was perfect for laser cutting with long straight edges and curves on each end. We could have CNC punched them but they would have needed a lot of cleaning up and the ends would have to have been CNC nibbled which is never as clean as laser cutting. There were a range of blanks needed that were all programmed within our Radan sheet metal software and then using the multi-part nesting feature we were able to get the best fit across the whole range of parts that needed to be laser cut for the customers order. 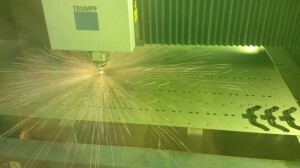 The laser cutting machine is a Trumpf 3030 fibre laser with a 3KW solid state resonator. 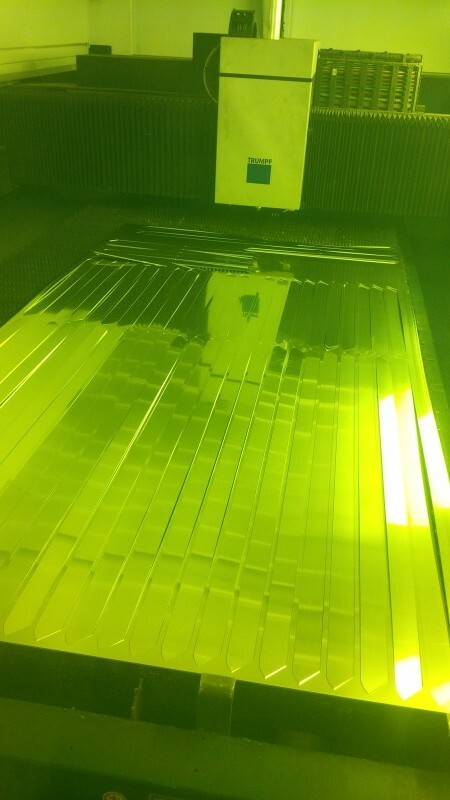 The viewing screen on the laser cutting machine gives a greenish tint to the photograph as it has to filter the light generated by the laser to protect the operators eyes when viewing the laser in action. 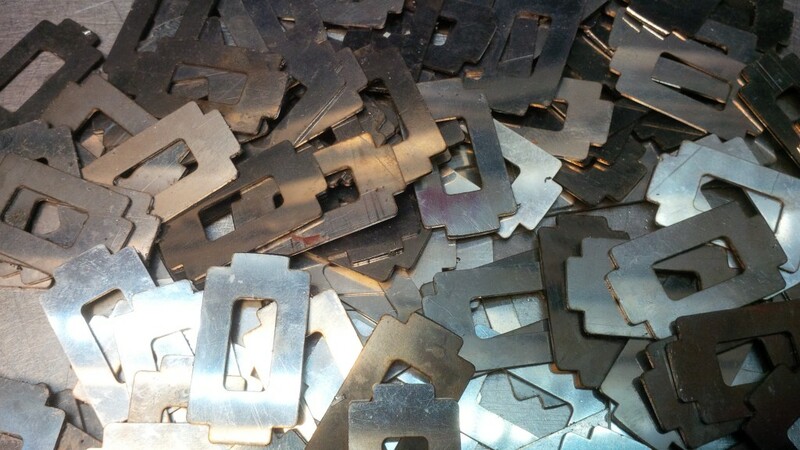 If you have an aluminium sheet metal component that needs laser cutting or any other material we would be happy to take a look for you and produce some prices for you. Please call us on 01489 577786 or e-mail your drawings as 3D files (STEP or SAT) or 2D (DXG or DXF) to sales@vandf.co.uk. 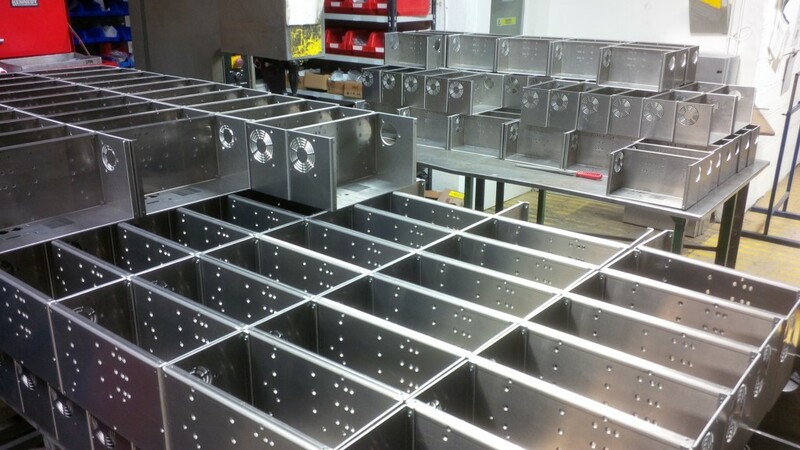 Whether you are looking for aluminium electronic equipment front panels, stainless steel angles brackets, mild steel chassis plates, zintec lamp holder brackets, galvanised steel boxes, copper earthing strips or brass display housings we can laser cut them here for you in Hampshire. Using a Trumpf 3030 3KW fibre laser allows us to laser cut the widest range of ferrous and non-ferrous sheet metal materials. These 2 projects were laser cut by us in October 2015 and are typical of the laser cutting work that we carry out every day of the week. Both sheet metal projects were laser cut from mild steel and needed no edge de-burring after laser cutting due to the exceptionally clean cut that was produced straight for the machine. It’s interesting that sheet metal work with large circular holes are not easy to produce with a CNC punch press without “banana” tooling that has been ground to the correct radius but the opposite is the case with laser cutting. With laser cutting circular holes are not only easy in any diameter but are so quick to cut that you have to see the machine to believe it. There is a video below of a thin gauge galvanised mild steel component being cut, watch out at 18 seconds and again at 43 seconds to see just how quick this machine can cut large circles. If you are ever passing the door while in Hampshire please give us a call and we would be happy to show you the machine laser cutting in action and discuss any sheet metal laser cutting projects that you might have.